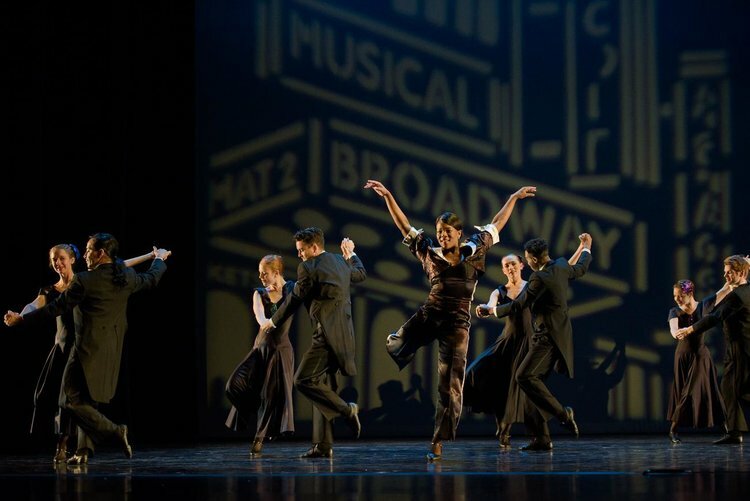 Ursula Perry (center) and members of Repertory Dance Theatre in Bill Evans’ “Suite Benny.” Photo by Sharon Kain. With tap shoes, reading glasses, and a relaxed yet specific performance demeanor, William “Bill” Evans literally (and figuratively) stepped into the spotlight at the conclusion of his solo, “Three Preludes.” This piece blends the sounds (which were unfortunately muffled on the marley floor) and rhythms of tap dance with the lyricism and emotional ventures of modern dance. 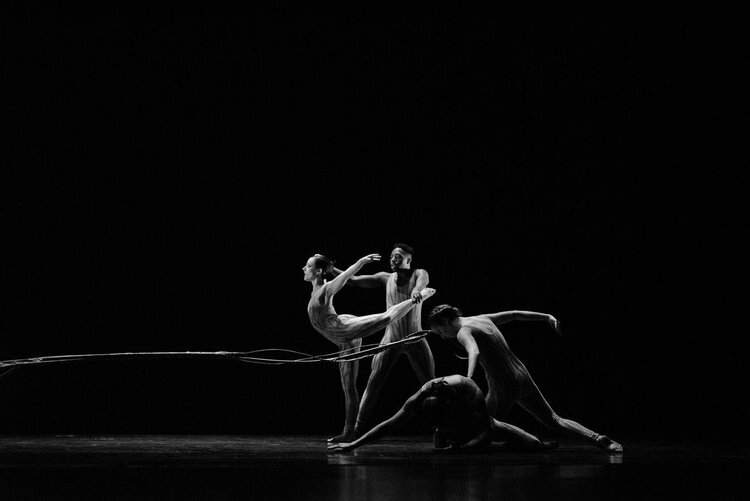 “Three Preludes” was choreographed to honor Evans’ late mother, Lila Snape Evans, and was programmed in the middle of Repertory Dance Theatre’s Top Bill, an evening that included six works, all created by Evans, spanning 1970 to 2015. It is fascinating to open the “modern dance time capsule”; RDT does this regularly, as it brands itself as a living library, a breathing museum, of modern dance. This mission can be challenging for an art form that was born out of rejecting what came before and one that is often neurotically trying to rebirth itself with the new and avant-garde, sometimes at the expense of baffled and unwilling audiences. Top Bill not only opened the history book but narrowed the scope to one artist, so we could see where modern dance was 47 years ago (“For Betty”), both in terms of trends and for one individual, and in contrast with the trends and interpretations of 2015 (“Crippled Up Blues”). This programing also brought up questions of timelessness: why, despite being impeccably performed, did “For Betty” show its age at 47 while “Tintal,” just two years younger, existed in the elusive wrinkle in time, leaving me captivated enough to forget past, present, and future? My opening-night performance companion was my mother, who was born and raised in a three-bedroom home in Cedar City when it truly was a small town. She lived in the three-bedroom home with her parents and nine siblings and, when it was bulldozed to the ground to make way for commercial development, the local paper wrote about how sad it was to see a place that housed memories for so many people disappear. It is now a car wash, wedged between two gas stations. My mother now lives in Orange County, California, where I was raised but, at Top Bill, she was taken back to her Utah college dance days of piling in Prof. Whetten’s car and making the four-hour drive to Salt Lake City to see Bill Evans dance. In fact, this was my third time seeing “For Betty” resurface, and, similar to its previous performance, this rendition was full of joy and technical mastery. 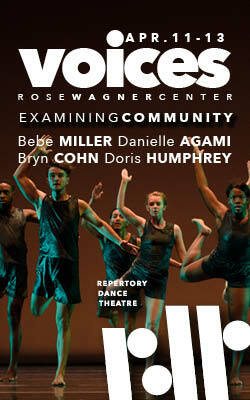 However, this performance felt especially embodied with a fullness of execution and, at times, a curiosity in approach. The difference was as subtle yet as distinct as perfecting a movement in front of the mirror versus perfecting the same movement with closed eyes. The dancers were not performing what the movement should look like but rather were experiencing each curve, swing, and jump as a dimensional body in space. Dan Higgins and Tyler Orcutt in Evans’ “Alternating Current.” Photo by Sharon Kain. Dan Higgins and Tyler Orcutt performed “Alternating Current” (1982), a duet in which Higgins played the flame, flickering and teaming with kinetic energy, while Orcutt played the moth, flighty and dangerously drawn in. A building motif, Orcutt would run into Higgins’ embrace, unable to resist its pull and then, just as quickly, would sprint offstage, leaving Higgins to writhe in solitude. I appreciated the focus and clarity of the choreography, but also wondered what would happen if the dancers traded in their costumes that were spotted with literal flames and instead dressed as themselves, two men trying to grapple with the electric, even deadly, charge between them. Could this other version have existed in 1982? If not, it could certainly exist now. “Tintal” was the highlight of the show; Evans drew on his studies of Bharatanatyam and West African dance while choreographing it. Not many pieces cause me to lean forward in my seat in an attempt to capture every texture and layer, or to see the dancers as otherworldly. The set, designed by Kay Burrell after the original by Ivan Weber, cut the space into background and foreground and placed the dancers in a world of prehuman organisms that slumbered and awakened with curved spines and rooted bodies. 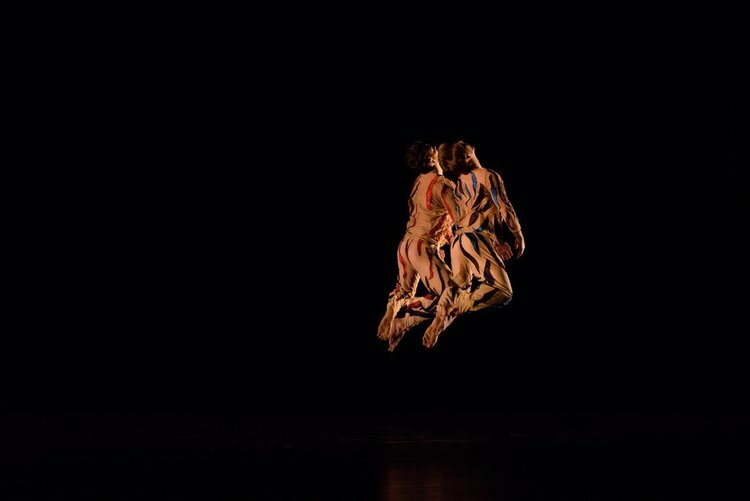 Efren Corado Garcia and Lacie Scott had an especially captivating duet, their spines undulating as if boneless bodies in unison, summoning the earth and its energy. “Tintal” ended in silence, suggesting that its world continued on indefinitely; if it did, I would be there to watch. Next up was “Suite Benny,” reimagined in 2017 from a 1987 creation and dedicated to Janet Gray (an iconic Salt Lake City dance teacher), followed by the program closer, “Crippled Up Blues,” a premiere in 2015 for the company’s 50th anniversary. “Suite Benny” evoked the era of old Hollywood films, with twirling ballroom dancing and carefully paired couples circling the stage. This nostalgia was initially lost on me, and I settled in to let the movement wash over me. Enter Ursula Perry and Lauren Curley: two magnetic leaders, two chaperones that encouraged rather than monitored, two women who decided that pairing off with a partner would not suffice. Instead, they wove in and out of the onstage couples and performed to the audience, with animation and confidence, that they would pave their own way in their created world. “Crippled Up Blues,” took the program full circle, exhibiting ever-changing aesthetics and how an artist evolves over time. The beginning consisted of multi-focused vignettes, emerging as quickly as they dissolved, and a constant yet morphing emotional landscape. The piece eventually settled on what felt like a more familiar trope: dancers clapping and slapping their bodies, marching in plié. This led into the cast posing as the elderly, shaking with hunched shoulders in their chairs, their bones drying out in the desert heat. I preferred the more ambiguous and disjointed beginning world, as I am a product of my own time. Lauren Curley (left), Justin Bass, and members of Repertory Dance Theatre in Evans’ “Tintal.” Photo by Sharon Kain. 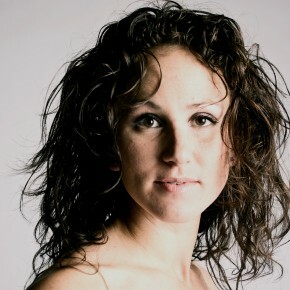 Erica Womack is a Salt Lake based choreographer. She teaches at SLCC and regularly contributes to loveDANCEmore.